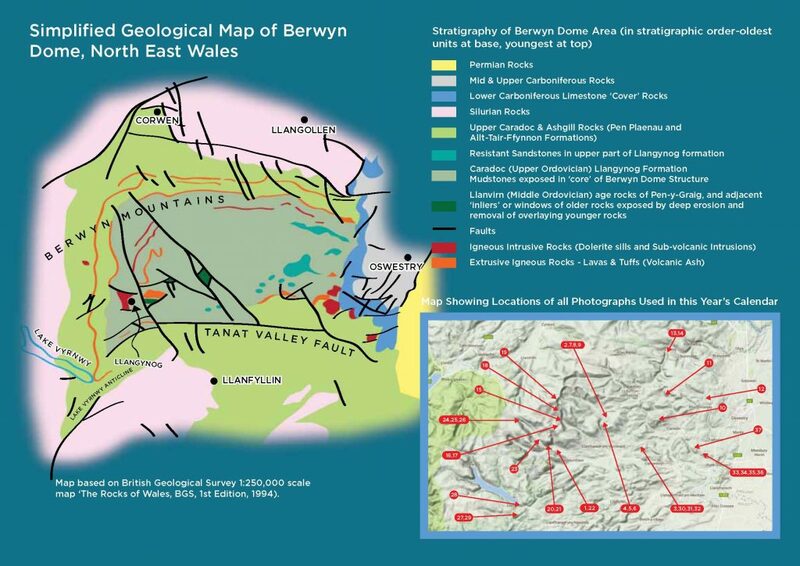 This year we have focused on The Geology and Scenery of the Berwyn Mountains, North Wales. Photo 1 (above). Craig Rhiwarth mountain, left background, and the slopes of Glan Hafon, right background, rise steeply above the green fields of the Tanat Valley, in the southern Berwyn Mountains. In the centre background, between these two hills, lie the equally steep slopes of the Cwm Glan-hafon valley, which lead upwards to the distant summits of the main Berwyn Mountains in the far distance. It is the geology and landscape of this beautiful part of northern Wales that we explore in this year’s Geoscience Wales Calendar. The Berwyn Mountains are another relatively little known region of north-east Wales (see map at the end of this introduction for their location, and for the locations of all photos used in this year’s calendar) that lies just to the south of the Clwydian Range and Denbigh Moors areas, which we explored in last year’s 2016 Geoscience Wales Calendar. These mountains lie between the towns of Bala, in central North Wales, to the west, and the town of Oswestry, at the edge of the Cheshire Plain, in the east. Although they rise to over 830m (2712ft) above sea level, and are therefore the highest mountains in north-eastern Wales, they are located in a relatively remote part of the Welsh Borderlands, away from the main transport routes of the Cheshire Plain to the east, and from the tourist hotspots of the North Wales coast and Vale of Llangollen, which lie to the north. However, to the traveller or tourist with a keen eye to explore new areas, a little off the beaten track, they represent an area of outstanding scenic beauty, with high rocky summit ridges, wild moorlands, deep cut craggy gorges and picturesque rural villages nestled in mysterious and remote hidden valleys; in addition, they also display some fascinating geology. Geologically, the Berwyn Mountains can also be relatively clearly defined, and the area is often known as the ‘Berwyn Dome’, but what shape is this dome, how was it formed, and what is its structure like in greater detail?